anti-family, the exact continuation of the politics of the last five years." (Paris) France is preparing for the presidential elections. Last Sunday, the electorate succeeded in what the opinion research institutes had already said in the weeks before. In four months the establishment, with the help of the mass media, succeeded in catapulting a former socialist baggage carrier, the Rothschild banker and minister of the outgoing president François Hollande as a "wonder worker" in a few months.The civil rights movement Manif pour tous warns against Macron and has published an denunciation: "We say no to Emmanuel Macron on 7 May." While the government of Hollande lost all citizens' credibility and their official candidate Hamon could barely earn more than a disastrous six percent of the vote, Emmanuel Macron seems to be bursting with reliability. Macron would be the eighth President of the Fifth Republic, but he would already be the second employee of the Rothschild Bank in the highest state office. The other was Georges Pompidou, who on 3 January 1973 prohibited the Banque de France by law from lending money to the state. Since then, the latter has had to squeeze money from private banks at high rates of interest and interest rates, including the Rothschild Bank. The four-year interim at Rothschild made Macron a millionaire. Hollande took him as an advisor to the presidential chancery after his election victory, while Macron "qualified" among the "Young Leaders" of the 2012 Graduate Class of the French-American Foundation as a Euro-Atlantic lobbyist for higher offices. In 2014 he took part in the Bilderberg meeting in Copenhagen and was promoted shortly thereafter as Minister of Economic Affairs. The stroke of genius by the French establishment with Macron, captivating sociologists and political scientists, if they are left free and uninhibited, will continue. The masterpiece shows the importance of PR agencies, programmed image campaigns that have been thoroughly studied. 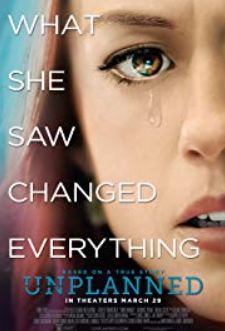 It also shows how helplessly large parts of the population are at the mercy of the media manipulation of those who control the opinion-forming media. When even provincial papers from other countries, uncritically celebrated Macron after the Sunday election as a "young high flyer" of politics, they only repeat that which they themselves are fed by others. The election campaigns have long had nothing to do with reality. As a clever head said, "If elections were to change something against the will of the establishment, they would be forbidden." Macron has a picture book career behind him, his work history reads impressively, but can not, on closer inspection, conceal the fact that he was a protege during his lifetime. And precisely as such, he is now standing as a candidate for the Elysée Palace for others who have held their protective hand over him. On the evening of the election, the representatives of the establishment had tended to assure Macron of their vote. The citizens movement Manif pour tous , however, warns of Macron's voice, because "it is openly anti-family." The citizens' movement had arisen from the resistance to the socialist social policy which Hollande began to enforce with uncompromising harshness after his election victory in 2012. 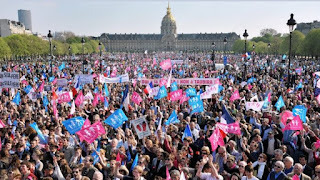 Whether promoting abortion, legalization of gay marriage, legalizing euthanasia and "surrogacy", introduction of adoption rights for aberrosexuals and gender ideology, to kindergartens and schools, whether the criminalization of the pro-life movement or Manif pour tous, whether the open declaration of war against the Catholic Church by Socialist Ministers, Macron had never heard a word of contradiction. As a socialist party soldier, president, and minister, he was unconditionally involved in the campaign against the natural order of the family and the state. Grand Orient of France: "We choose Macron"
On June 21, 2016, Macron, at that time still a socialist party member and an economic and industrial minister, had presented himself at the headquarters of the Grand Orient of France. Before the fraternal brothers, he was allowed to give a lecture on "Is globalization compatible with progress?" This was a non-public event. There can hardly be any doubt that it in fact involved his bid as a potential candidate for presidential elections. Two months later, he resigned party membership and ministry. 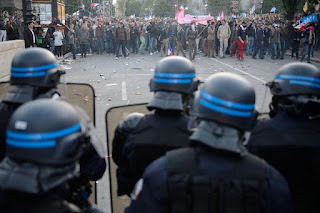 Manif pour tous: "Macron is the continuation of the policy of the past five years"
Manif pour tous, the movement which gathered millions of Frenchmen to rallies in opposition to the anti-family policy of the Hollande government, published the statement "No to Macron!" For the families, for the children, for the upcoming election. The future we will say no to Macron on 7 May," said Ludovine de la Rochére, the chairman of the movement. "The Emmanuel Macron program is a continuation of the anti-family policy that has been imposed on France for five years." A victory Macron means the "destruction of civilization" with "new injustices and inequalities for women and children." Politicians are bound to the general good. Macron's program represents "other" interests, "which is why we call upon all to go to the polls and vote against Macron." Macron is not only the candidate of the Rothschild Bank and the Grand Orient of France, but also of Islam.The Grand Mosque of Paris called on the Muslims of the country to elect Macron at the election on Tuesday. Macron stands for a policy of "openness," which primarily means "open borders" for the Muslim umbrella association for mass immigration. Movement Bloch. Addressing fellow citizens in a letter published on Francetvinfoin, a group of young officers who define themselves as such, have sworn oaths to belong to a different corps of the French army, pledged to defend their countrymen and the interests of France. Referring to Marc Bloch, these young officers rely on the spirit of resistance within the army, who has became their ideal today. For the record, we read in the letter that the Movement "Bloch denounced the maladministration of the army and the neglect of the French elite in the 1930s. Bloch was also an exemplary officer during two world wars, and part of the Resistance till when he was shot by the Nazis. We claim him because he was a true soldier and a lucid analyst through that precipitated the defeat in France." As a Dreyfusard, it's rather difficult, to say nothing of ironic, to link him to French Traditionalist Catholics, but that won't stop anyone from doing so. Still, it's easy to associate cries for the stability of the nation's defense with the reaction, and with legitimism in France. Destruction of the French army. Already during 2011,we have read that 10,000 soldiers were deprived of their pay. "Premiums for dangerous missions are not paid, which represents a significant shortfall", complained the soldiers' families. In 2012, there are thousands of soldiers who have not yet received their salaries for the month of December, which could only tap into their savings to pay for Christmas. Regularly, many soldiers receive 150 euros a month to live. Debt, many people have been thrown into a catastrophic financial situation from bank overdrafts and having to live with their parents. The worst is that these civil servants are forbidden to give their personal opinion on the situation subject to disciplinary sanctions. Invideo posted on its website, which also evokes the secret defiance Lys Noir, General General Vincent Desportes explains that "in Mali, the Army fought with 40-year old equipment and with vehicles without air conditioning. Only 10% of the Army is up to standard. The French army is in the hands of the United States. That the United States will soon drop the need to save France and the French army because when you do not have defenses, you are attacked. The version of the White Paper in 2013 shows that the army will not be modernized." Among the Spring demonstrators for France are the Veilleurs (Those keeping vigil, scroll down) who were arrested by the police, there are children of soldiers of the French army and many Catholics. These children of soldiers whose parents are responsible for sacrifice for France can not now accept and swallow that in their country they are treated like criminals. "The Veilleurs and 750 demonstrators were arrested during the French Spring" they say. Although the discourse in the online magazine Arsenal seems to go far in the hope of a military coup, it does not hide in how much of a deep malaise, the society is actually divided. [Tempi] The location from which he was to have given his speech was in front of a large painting with Christian themes. When the museum officials wouldn't move or cover the "offensive" painting, Hollande then canceled his visit. 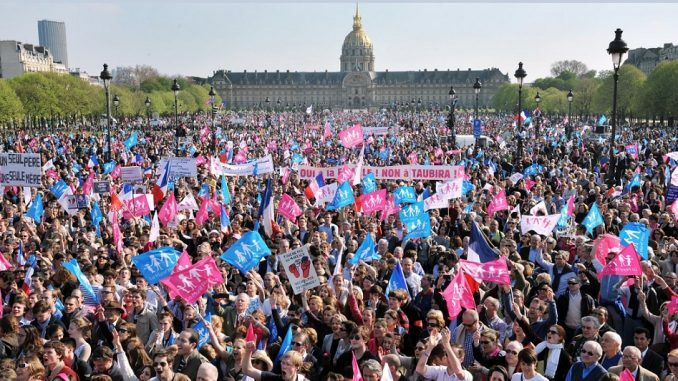 The Right and Left, the unemployed and protesters of gay marriage, all opponents of Francois Hollande had gathered April 28 in front of the Museum of Fine Arts in Rouen to protest against the policies of the socialist government. Here the French president was to inaugurate an exhibition on Impressionism accompanied by three government ministers two days ago, however, Hollande has canceled the visit. AVOID THE DISPUTE. The French newspapers have advanced two hypotheses for the cancellation of the visit. The first is political. To avoid disputes, Hollande preferred to postpone, given that among the demonstrators there were many unemployed people ready to accuse the socialist president that unemployment in France has hit a new record: 3,000,000 and 224,000 French people are looking for work, according to data released yesterday by the national employment poll. RELIGIOUS BACKGROUND. The second hypothesis is of very different character. In view of the president's visit, a government delegation made a visit to the museum to check where Hollande would have to give his speech. Since the "pulpit" was placed right in front of a huge canvas with a religious background, Christian to be precise, the delegation asked the organizers to move it. Impossible task, given the size of the painting. He was then asked it to be covered with a giant blue canvas. Hollande AND CHRISTIANS. According to some newspapers, Hollande would have canceled the tour in order not to talk behind a Christian painting. Assumptions are unconfirmed but that would not be a unexpected, given that the socialist president is less than happy in his relationship with the Christian religion.